Dr Kent Morris, an Electrophysiology Lab Director from Norton Health Hospital in Louisville, KY learned of CIS products through colleagues. Dr. Morris contacted Grant Samuelsen of CIS to discuss the possible benefits of installing a CIS system of shielded power cords and 6-outlet CIS power distribution units. Also discussed was the electrical systems for the new labs Norton Health was building. CIS consulted with the team at Norton Health regarding the installation of a low-noise electrical system. Grant Samuelsen also visited Norton Health to demonstrate the CIS products effectiveness at essentially eliminating the problematic noise that had limited their ability to resolve images of the heart and the delicate heart signals of patients. Dr. Morris was amazed at the significant drop in measured noise as well as the superior resolution afforded to him while performing his procedures. Dr. Morris’ detailed comments are below. "Our EP lab had been having noise issues (that had worsened since the last upgrade to our mapping system) and we had not found a solution despite our best efforts. Both our hospital biomed engineers and the field engineers for the mapping company had looked at and tested the system multiple times without resolution of the noise issues. After installing the CIS units, the bipolar noise levels on the mapping catheters went from fairly high at .13-.15 to less than 0.01 mV after installing the first of the two CIS units and remained at that level after installing the second unit. As I mentioned before, 0.01 is the lowest the system can measure so the noise level for the bipolar signals is now below the threshold of what the system can measure." "Some of the newer software does have the ability to use both the bipolar signals and the unipolar signals in mapping, so the unipolar signals do matter. The unipolar noise level prior to installing the second CIS unit was somewhere around 0.12 - 0.15 mV which is certainly higher than I would like and after installing the unit was a little more acceptable in the 0.06 - 0.12 mV range so from slightly less to about half the noise level, but there was some variation and still some residual noise. Then we made a discovery. We noticed that if you gain up the surface ECG leads, there was noise at the same frequency as on the unipolar channel. The unipolar signal is comprised of the distal pole on the mapping catheter to the surface ECG leads attached to the patient. So we started to suggest something external that the ECG cables were picking up. So we moved the x ray tube completely out from the patient as far back as possible and as we were moving the x ray tube out you could see the noise levels decrease. With the x ray tube as far back as possible the unipolar noise level was now generally less than 0.03 mV and the noise on the surface leads were pretty much gone. When we moved the x ray tube back in the noise returned to the previously mentioned levels. So at this point essentially all of the remaining noise appears to be emitted from the x ray tube. I would think that this is important for you to be aware of because otherwise it might appear that there is residual noise that your filters are not removing when in fact in our lab this appears pretty convincingly to be emitted radiation/noise." "This makes the CIS units invaluable as a diagnostic tool because they essentially rule-out electrical sources of noise." 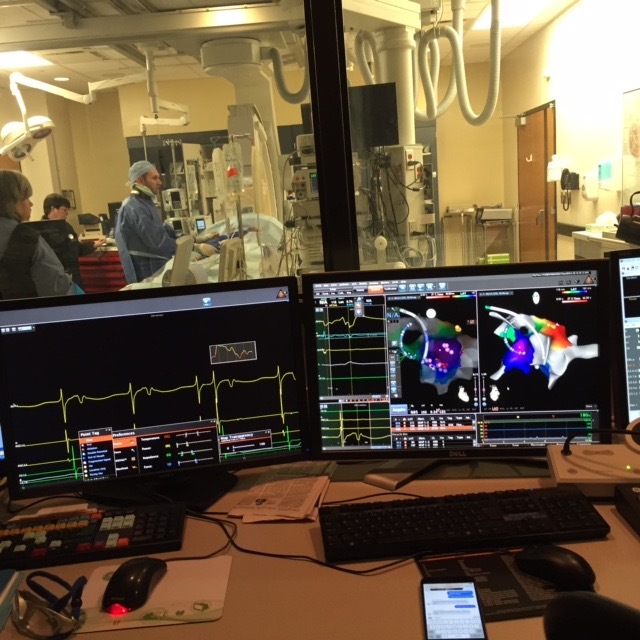 Clean and noise free signals are critically important to successful mapping and ablation cases. The improvement offered by the CIS units in our lab has proven to be invaluable because they essentially rule out all but external sources of noise. Thank you!